In this weeks edition of 'Under The Spotlight' we talk with a good friend of Conservation Guide, Sam Ferguson, Founder and Director of The Sustainable Birding Company. Sam is a passionate conservationist and has a particular penchant for animals of the feathered variety. Sam has worked on a huge variety of ecological surveys and projects from birds in Madagascar to surveying moths in the beautiful countryside of Surrey, England, but what really kick started his career was his African fieldwork. He has spent a vast amount of time with varying NGO's and volunteering positions, and it's through these experiences that Sam's love for birds grew. My passion for conserving nature and the environment started at an early age through taking weekly strolls up the Malvern Hills with my family. The beauty of these hills and the wildlife that inhabits them really struck a chord in me and made me realise that I wanted to help protect the natural world. This eventually led me to volunteer on fantastic conservation projects around Africa, where I am now living and working. I truly can't see myself doing anything else! Where to start? We all know that better carbon emission policies would have a big impact on climate change, but we also need to increase our awareness of how dairy and meat farming practices and consumption also needs to change. When it comes to wildlife conservation, the biggest threat comes from the ever-growing human population and human encroachment on natural environments, so population control matters - we need to better link population health work with conservation work. "instead of controlling the environment for the better of the population, perhaps it's time to control the population to allow the survival of the environment." Sustainable Birding Company - Gotta catch em all! Well, something that is very close to my heart is ecotourism. What we're trying to achieve here with The Sustainable Birding Company is for birding tours to be used as a tool for the conservation of local bird populations. If local people can make a genuine active living from the wildlife around them, they will be truly inspired to protect it. We have only the best bird guides, meaning that our clients not only benefit from their huge local knowledge but that they are also supporting local livelihoods. By choosing to go on a tour with us, our clients are actively choosing to support a sustainable approach to tourism in East Africa and we're very proud of that. I've had the privilege of a lot of amazing encounters, all of which were memorable in different ways. A recent one that springs to mind is on a birding/safari tour in Amboseli National Park, Kenya a few weeks ago. We were driving around in search of interesting bird species, when we came across a large herd of Elephants with a small newborn calf. Incredibly, our guide then spotted two young male lions up a tree quite near to where the herd were happily feeding. We stopped and waited for 15 minutes, and then the elephants must have smelled the lions, as they suddenly started walking toward the lions as if to say 'we know you're here'. All members of the herd started to crowd around the newborn calf to protect her until the two lions eventually saw sense and retreated. This incredible moment truly reinforced the beauty of nature for me, and why I've always, since I can remember, wanted to conserve it. Alfred Russel Wallace or Alan Root - hard to choose! The Sustainable Birding Company offers high quality Birding, African Big 5 Safari and Photography Tours in Kenya and Uganda that directly contribute to the conservation of local birds and wildlife. 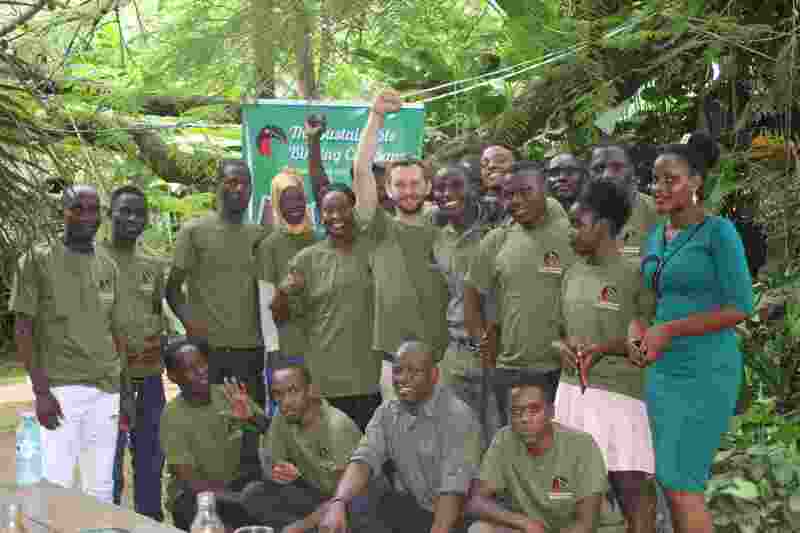 Their Model of sustainability involves donating a percentage of profit to local wildlife conservation NGOs and their own personal Sustainable Projects, mitigating against environmental impact, and creating opportunities for young people to get inspired by birding. Sam only employs the best local bird guides, meaning you not only benefit from their huge expertise but you're also supporting local livelihoods. By choosing to go on a tour with The Sustainable Birding Company, you are actively choosing to support a sustainable approach to tourism in East Africa.